It was 113 degrees today in Phoenix,Arizona. That was a record for heat on this day in all of recorded history. Many of us decided to just stay indoors with much of our time spent at home. But, that also meant that your air conditioner was going to set its own records just trying to keep up. When your air conditioning system is tasked with heat like it was today, it may have to run continuously to try to keep your home cooled. That means every component is running at record pace and time. This is tough on an HVAC system as you can imagine. This is what causes an A/C system to prematurely age. It doesn’t mean it will break down or die a grueling death in the record-breaking heat, it just means that, understandably, it is going to work harder than it ever has. You may receive a record-setting utility bill, as well. But, here’s something you can do to try to keep it somewhat in check…in extreme heat, try reducing the temperature setting on the thermostat a degree or two. For every degree you reduce the temperature in your home, it should cost you 4-6% less in energy usage…and that means you will pay less on utility bills. Alaskan Air Conditioning and Heating is all over this heat with new HVAC system available for install and repair technicians ready to help your system manage through the record-breaking temperatures. 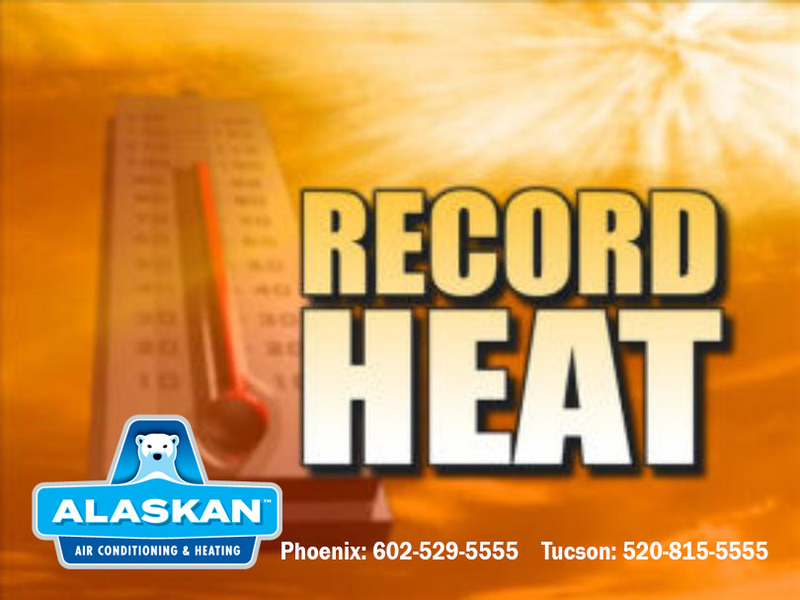 Don’t suffer in the heat if your system breaks downs, call us at Phoenix: (602) 529-5555 or Tucson: (520) 815-5555. Or, schedule at https://www.alaskanac.com/contact-us/. We offer budget-friendly financing options with no money down.